Want to help name worlds beyond our solar system? Well, here's your chance. Between now and October 31, 2015 you can enter a world wide contest sponsored by the International Astronomical Union (IAU) as explained by the IAU News Release:. The NameExoWorlds contest, organised by the IAU, is now entering its historic final stage. The public voting on the shortlist of names for the ExoWorlds — 20 planetary systems comprising 15 stars and 32 exoplanets — starts today (8/12/15). 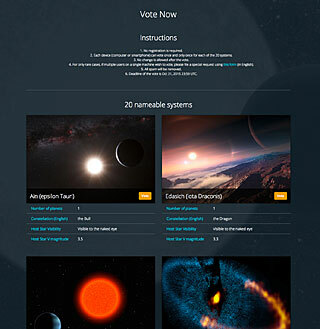 The vote will decide the names for the selected stars and exoplanets. It's easy and fun to vote....take a few minutes to be part of history.